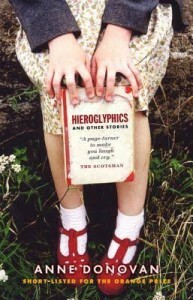 As well as the collection, Hieroglyphics and Other Stories, Anne has published many other stories. Details of some of these are listed on this page. A beautiful collection – charming, witty and touching – these stories give voice to a variety of different characters: from the little girl who wants to look ‘subtle’ for her father’s funeral, a child who has an email pen pal on Jupiter and an old lady who becomes a star through ‘zimmerobics’. Often writing in a vibrant Glaswegian vernacular, Donovan deftly gives her characters authenticity with a searing power, aided and abetted by tender subtlety. The short story All That Glisters won the prestigious Macallan/Scotland on Sunday Award. Six stories from Hieroglyphics and Other Stories are set texts for the Scottish National 5 exam. Information of particular interest to teachers and students is included in the relevant menu. Audio versions of three of the stories, recorded by Anne are available here. Anne was commissioned to write two stories for the charity Artlink. Artlink is an arts and disability organisation whose aim is to increase opportunities to take part in the arts for those who experience disadvantage or disability and to help encourage positive change. This story, which deals with the issue of caring, was published as a pamphlet. Anne spoke with carers, who talked about their lives, and created a fiction piece based on some of the issues they raised. You can read the text of the story here. You can listen to Anne’s reading of But here. Beautifully illustrated by Tess Wood, this story explores the issue of mental health from the perspective of a child and is intended for upper primary school children. It may be of special interest to teachers. You can read Angel Wings here. Copies of the book and teaching materials are available from Artlink. All Artlink’s publications are also available in Braille, tape and large print formats. In the short story, Not Scotland, Jimmy, the main character in Buddha Da, goes to work abroad. Published in There, one of the volumes of Elsewhere. Elsewhere is an anthology of the stories commissioned by the Edinburgh International Book Festival on the theme of ‘Elsewhere’ (2010). A beautifully produced set of four books, it includes stories from major Scottish and international writers. You can listen to Anne’s reading of Not Scotland here. You can find more information about the project Elsewhere here. The story of a young girl, working in the ‘fatal trades’ during the early 20th century. Inspired by an artefact from Glasgow Womens’ Library. Commissioned by Glasgow Womens’ Library and published in 21 Revolutions, a beautiful book containing 21 stories and 21 pieces of artwork from leading woman writers and artists. You can listen to Anne talking about and reading Lassie Wi A Yella Coatie here. You can find out more about the 21 Revolutions Project here. Hieroglyphics and Other Stories has been translated into German by Eva Bonné (Ihr schönstes Kleid). The short story Hieroglyphics has been translated into Spanish and can be found on the website of the Barcelona Review.